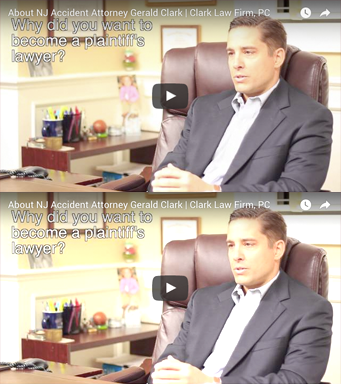 The Clark Law Firm, PC is a personal injury law firm in New Jersey. The law firm provides high quality accident case legal representation with personal attention. Our personal injury law firm will at all times provide open, honest representation. We will promptly return your calls and/or e-mails and will be responsive to your needs. Our attorneys are competent in a wide range of civil and municipal court matters. Our concentration is on personal injury and accident cases. We are advocates for community safety and protection. Click on the practice area links below to learn more about the types of cases the Clark Law Firm, PC can assist you with. If we can not handle your particular matter, we can help you find other competent attorneys experienced in your particular facts that can. For aggressive attorneys to handle your accident or injury case, contact the Clark Law Firm, PC today.